It is essential in the modern connected world to access your data anytime, anywhere with your latest mobile gadgets. 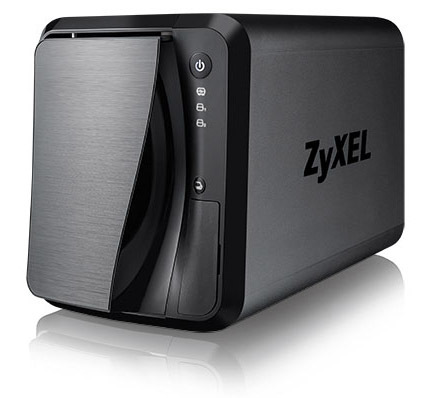 The Zyxel NAS520 2-Bay Personal Cloud Storage is an one stop for all your private documents, photos, music, and videos to provide the most convenient access to all your digital contents. The Zyxel NAS520 is equipped with a 1.2 GHz dual-core processor and link aggregation. A high performance engine utilizes both Ethernet ports to provide up to 106 MB/sec read and above 85 MB/sec in write. Instantly retrieve data from your mobile devices, backup files, and stream UHD 4K video contents without performance stutter. 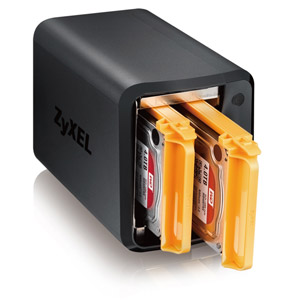 The bolt free design makes it convenient to install your hard disks into the Zyxel NAS520 without any screwdrivers or other hardware tools. Incorporate with myZyxelCloud, Zyxel free Dynamic Domain Name System, to create a personal cloud and access all your digital contents away from your home on your favorite mobile device(s). Compared to a typical desktop server system, the Zyxel NAS520 intelligently saves power during low activity to significantly reduce cost on electricity usage. 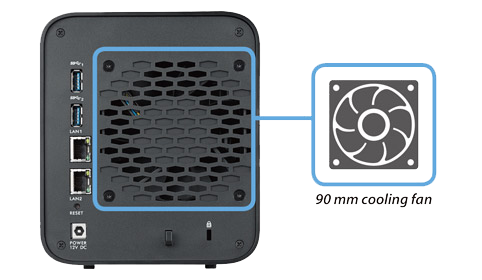 The quiet 90 mm fan cools down the drives inside for better protection from heat damage. Customize it even further with the easy App center to install and update apps of your preference. Download the Zyxel NAS520 Datasheet (PDF).